95 Mbps. That’s the average fixed U.S. internet connection speed today. U there? It matters. You can check yours with Speedtest. 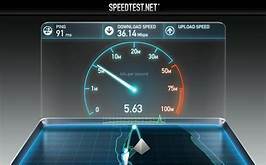 It will measure download speed, upload speed, and latency, thee three key performance metrics for connecting computers. Starting yesterday, most of what you do, and could do, on a computer, or even a TV, is capped off by speed. It’s like plumbing: You get no more than what the pipes hold. CE A16-9: 815 KAR 6:010E§6(2) 14 hrs Inspecting & Report Writing; Electrical, HVAC, Plumbing, Structure, Roofs. Hands-on, Onsite Training.